Hi! My name is Dr.Renee Chevalier. I teach all levels of piano in my home in Menlo Park, CA; my students call me Dr. Renee. Anyone who wants to play the piano, from five-year-olds through seniors, can take lessons from me. My oldest beginners have been in their eighties! In the beginning of my teaching career, I was keen on developing concert pianists. But by now I’ve come to realize that it’s not only the budding talents who need pianistic training, but anyone who loves music and wants to learn to play music—at any level, even that of incompetence—as long as it gives them enjoyment. Whether they develop into great pianists or just play for their own pleasure, playing the piano offers each person an amazing opportunity to discover and enjoy fully the hidden treasures of music. I’ve also learned over my thirty-plus-year teaching career that music-making which is not fun, is not worth making. Furthermore, if it’s not fun to learn to play, why should anyone want to do it? So I try my best to make lessons fun and exciting! I feel I have achieved my greatest goal when my students come to think of music as an indispensable part of their lives. "Thank you for all the joy and music you’ve brought to our home ..."
"Many thanks for giving me the gift of music …"
"Thank you so much for being so nice …"
"Thank you for your patience and uplifting spirit, even at the most exasperating moments. You make music a joy to behold!" "I want to say how lucky we are to have such a wonderful teacher to bring music to our lives. 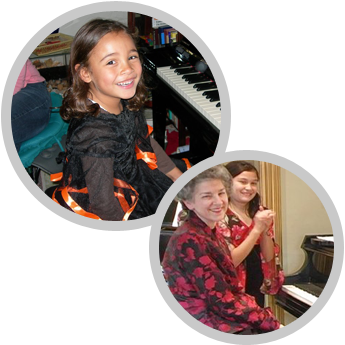 We appreciate you so much …"
Arrange to start your own fun-filled piano lessons. With Dr. Renee, you will work at your own pace and timing. Playing the piano will develop gradually almost without your knowing it's happening. Dr. Renee provides tidbits of important information with each lesson, allowing students to learn naturally and joyfully. She encourages students to play for others often and joyfully but doesn't have recitals; in this way students never need to associate with playing the piano the stress or pressure of deadlines. She focuses on keeping students growing musically session by session. Renee Chevalier wouldn't be a piano expert that she is today without the guidance of piano teachers Istvan Nadas and Adolphe Baller of the Alma Trio; chamber music string players Ferenc Molnar, Laszlo Varga, and Frank Houser, former members of the San Francisco Symphony and New York Phil. In addition, she values highly working with her brother and sister, Bernard and Denise, both professional violinists. If you need piano tuning services, Renee highly recommends Neil Paton. You may view the contact details of Neil here.